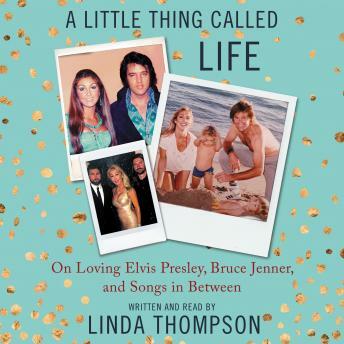 Award-winning songwriter Linda Thompson breaks her silence, sharing the extraordinary story of her life, career, and epic romances with two of the most celebrated, yet enigmatic, modern American superstars—Elvis Presley and Bruce Jenner. For the last forty years, award-winning songwriter Linda Thompson has quietly led one of the most remarkable lives in show business. The longtime live-in love of Elvis Presley, Linda first emerged into the limelight during the 1970s when the former beauty pageant queen caught the eye of the King. Their chance late-night encounter at a movie theater was the stuff of legend, and it marked the beginning of a whirlwind that would stretch across decades, leading to a marriage with Bruce Jenner, motherhood, and more drama than she ever could have imagined. Now for the first time, Linda opens up about it all, telling the full story of her life, loves, and everything in between. From her humble beginnings in Memphis to her nearly five year relationship with Elvis, she offers an intimate window into their life together, describing how their Southern roots fueled and sustained Graceland’s greatest romance. Going inside their wild stories and tender moments, she paints a portrait of life with the King, as raucous as it is refreshing. But despite the joy they shared, life with Elvis also had darkness, and her account also presents an unsparing look at Elvis’s twin demons—drug abuse and infidelity—forces he battled throughout their time together that would eventually end their relationship just eight months before his untimely death. And yet, despite her marriage unraveling, her search for love was not over, eventually leading her to the legendary music producer and musician David Foster, a relationship that lasted for 19 tumultuous years, resulting in a bond that spurred her songwriting career to new heights but also tested her like never before. Filled with compelling and poignant stories, A Little Thing Called Life lovingly recounts Linda’s incredible journey through the years, bringing unparalleled insight into three legendary figures. This book was really well written and I was so excited to find that the author narrates the whole book. Linda Thompson keeps things interesting throughout the book. I loved it! Linda Thompson eloquently writes about her relationships, family, and success as a song writer. She is truly a beautiful person on the inside and out. Her truthful , yet tasteful account of past relationships was endearing. Beautifully written. I have always been a huge Elvis fan, but her story showed another side to this man that the fans don't get to hear very often. She was very respectful, open and honest about her life story- very well written!